Rebecca Adler , a 29-year old kindergarten teacher, becomes dysphasic and collapses in her classroom. Dr. Gregory House initially refuses the case until Dr. James Wilson tells him that Rebecca is his cousin. When Dr. Lisa Cuddy tries to make House fulfill his clinical duties, he refuses but is forced to do them when his authorization to the MRI is revoked. He diagnoses Rebecca with cerebral vasculitis and her condition improves with treatment. 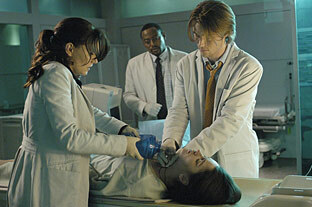 To find the source of Rebecca's seizures, House convinces Dr. Eric Foreman to break into Rebecca's house. At the hospital, Rebecca suddenly loses her vision and suffers another seizure. Foreman discovers ham at Rebecca's house, revealing both Wilson's lie and the cause of the seizure—tapeworms . When Rebecca refuses treatment, House persuades her otherwise by proving her condition with a non-invasive X-ray suggested by Dr. Robert Chase, which depicts a tapeworm larva embedded in her leg, supporting their diagnosis.